Sweet alyssum, Lobularia maritima, is a common annual flower plant. Lobularia maritima is a mat-forming annual or short-lived perennial native to the Mediterranean, Canary Islands and Azores, where it grows along the coast in rocky, sunny areas. Supposedly the flowers and leaves are edible and can be added to salads, and the plant has been used medicinally in the past, but people with sensitive skin may develop a rash when handling the plant, so it is probably best not ingested. This herbaceous plant in the mustard family (Brassicaeae) is commonly used as a bedding plant called alyssum or sweet alyssum, and is widely available in market packs at nurseries and garden centers in the spring. The common name refers to the genus in which it was formerly classified. 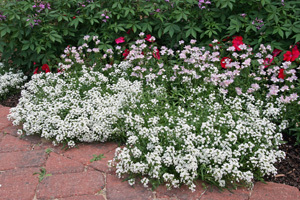 Sweet alyssum can be used as a seasonal ground cover. 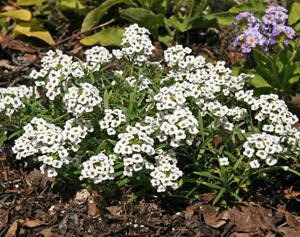 Alyssum grows 3-9 inches tall with a wider spread. Cotyledons are rounded and bright green, while the first true leaves are longer and narrower. The spreading mounds have well-branched stems covered with small linear leaves. The alternate, gray-green leaves are oval to lanceolate without any indentations. Because it is shallow-rooted, low, spreading, it makes a good living mulch or seasonal ground cover. The small flowers are attractive to beneficial insects like this syrphid fly. Flowers are produced over a long time – through the growing season or year-round in mild climates without frost. Each tiny flower has four petals. Many flowers are clustered together in dense terminal heads (racemes), and the plants may bloom so profusely that the foliage is completely obscured. The sweet smelling flowers have a honey-like fragrance and are very attractive to bees, flower flies, stingless wasps and butterflies. It is a particularly good nectar plant for beneficial insects as those tiny insects can easily access the tiny nectaries of the small flowers. The tiny, four-petaled flowers (R) are borne in terminal racemes (C) that cover the plant (L). The ‘Aphrodite’ series includes unique colors (apricot, salmon, lemon, and red, plus more standard purple and white) on early-blooming plants. ‘Clear Crystals’ is a series with extra large fragrant flowers in lavender, purple and white. ‘Easter Bonnet’ is an early blooming type with flowers in pastel shades of white, violet, rose and lavender. ‘New Carpet of Snow’ is a short, compact white-flowering form. ‘Pastel Carpet’ is a series that offers a blend of pinks, lavenders and creams. ‘Rosie O’Day’ was an All-American winner with rose colored flowers. ‘Royal Carpet’ has violet flowers that fade to lavender, creating a bicolor look. ‘Snow Cloth’ or ‘Carpet of Snow’ is an heirloom variety with white flowers. ‘Snow Crystals’ is a vigorous, mounding variety with large, clear white flowers. Snow Princess® is a sterile hybrid from Proven Winners that is supposed to be heat tolerant. Flowers are followed by flat round seedpods. The flower stalk elongates as the seeds ripen. The silicle (a dry pod-like fruit, a shortened (less elongated) version of a silique; also sometimes spelled as silicula or silicule) contains two yellowish to brown oval seeds, one in each half separated by a papery white skin. Alyssum inflorescence (L) with seedpod (middle, top) and oval seeds (R). Each pod half contains one seed (middle, bottom). Plants may reseed, but will likely revert to white flowered types on less compact plants than coming back similar to the cultivar planted. This low, spreading plant looks nice spilling out along a walkway. 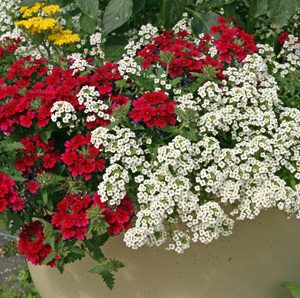 Alyssum is used as a bedding plant in annual or mixed borders and in containers. It combines nicely with many other short-statured annuals, such as shorter zinnias and marigolds, bright blue Lobelia, celosia, and snapdragons. 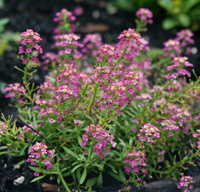 It works well as an edging plant, as an airy filler among young perennials, or as a ground cover when planted in masses. It can be overplanted among bulbs such as tulips and daffodils to fill in the area as the spring bloomers go dormant, or underplanted beneath clematis, daylilies or roses where its dense growth helps smother weeds. It is especially nice placed where it can spill over the edge of a container or hanging basket, or where its billowy blooms can cascade down a slope in a rock garden. 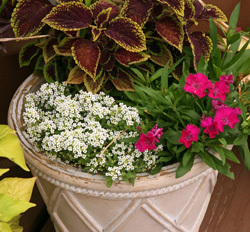 Alyssum is frequently used as a filler in containers or to cascade down the planters edge. This prostrate annual grows well in full sun in cool climates, but may do better in partial shade in hot climates. It needs average, well-drained soil with medium moisture. Although it may reseed, it is best to transplant starts in spring for the best flower display (especially in short growing seasons). It is very easy to grow from seed, either sown directly in the garden or indoors several weeks before the average last frost. Barely cover the seed, as it needs light to germinate. Transplants that have been hardened off can be placed in the garden a week or two before the average last frost, otherwise tender transplants should be protected until add danger of frost is past. It will start flowering within 6-8 weeks from sowing. 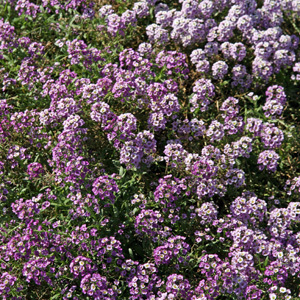 Although it will tolerate short dry periods, alyssum does best with consistent moisture. 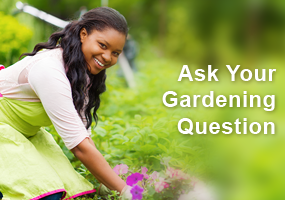 Do not fertilize heavily, as too fertile soil will promote more foliar growth than flowers. 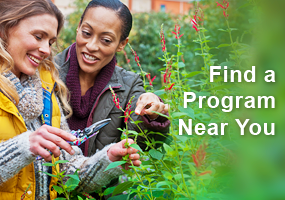 If plants are too wet or crowded, the dense growth may lead to rotting. Alyssum will flower more profusely if deadheaded. 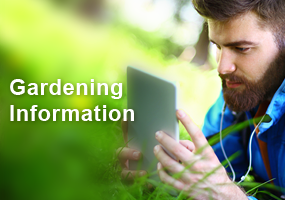 Overgrown or leggy plants, or those with more seedpods than flowers, can be sheared back to improve the appearance of the plant and promote reflowering. Like many brassicas, growth and flowering slows in hot weather; the plants will look ragged in the heat of summer, but will revive with cooler temperatures and last well into the fall. Light shearing, watering and light fertilization at this time will aid in their recovery. Older clumps may “split” as flowering only occurs on the outer edges and not in the center.